‘Parent abuse’ – where an older child causes physical, psychological or financial damage to a parent with the intention of controlling the relationship – appears to be a hidden yet increasingly prevalent problem. How might it be conceptualised? What do we know about it? What do responses to the problem currently look like? And finally, in what ways might psychology be able to contribute to this underexplored area? The quote above is taken from a research project that was not intending to explore ‘parent abuse’, but to look at how parents manage children who are involved in ‘offending’. However, in many interviews with mothers and fathers who were talking about life with their teenage sons and daughters, parents told me about these harrowing experiences (see Holt, 2009). ‘Parent abuse’ has been defined by Cottrell (2001, p.3) as ‘any harmful act of a teenage child intended to gain power and control over a parent. The abuse can physical, psychological, or financial.’ The term is useful in highlighting the abusive dynamic which appears to be at play in Maddie’s and other parents’ experiences, the effects of which have been found to be similar to the effects of other forms of family abuse (e.g. child abuse and elder abuse). However, this term is not without its problems: the term ‘parent’ hides the reality that it is most commonly ‘mother’ who is the recipient of such abuse. Furthermore, the term ‘abuse’ implicitly implies a ‘perpetrator’ who is an ‘abuser’ and this may not be an appropriate or helpful way of positioning somebody who is under 18 years of age. On the other hand, another frequently used term, child-to-parent violence (or ‘CPV’), is perhaps too narrow, given that we are clearly talking about more than ‘violence’. We are also talking about more than children ‘hitting out’ at parents, which in many ways may constitute ‘normal’ child/teenage behaviour (although it is debatable whether such normalisation is acceptable and at what point the ‘normal’ becomes ‘abusive’). Other terms, such as mother abuse, adolescent violence towards parents and youth-to-parent abuse have also been suggested in the literature. But again, they are all somewhat inadequate both in terms of what they over- or under-emphasise and in the binaries of power which they imply. Such difficulties in ‘naming’ highlight the complicated nature of the power relations involved in parent abuse. Given their access to economic, political and social capital, it could be persuasively argued that it is the parent who has significant power in this relationship. However, the increasing dominance of a discourse of children’s rights over the past two decades has meant that parents are increasingly feeling that their own parental rights are being subsumed (Holt, 2011; Reece, 2009). Indeed, it may be that any apparent increase in parent abuse is one consequence of the way in which government policy has increasingly framed the parent–child relationship in adversarial terms. The issue is further complicated by the gendered power relations that frequently (although not always – see below) characterise parent abuse: for example, in their observations of restorative justice conferences, Daly and Nancarrow (2009) found that in many ways (e.g. tactics of control, its cyclical nature) son-to-mother abuse mirrors the dynamics involved in adult male-to-female domestic violence within the home. The prevalence of parent abuse is difficult to ascertain. Notwithstanding the definitional problems, neither the police nor the British Crime Survey records such incidents and, in any case, it is likely to be hugely underreported by parents themselves. Furthermore, despite the recognition of parent abuse among practitioners who work with families, there is surprisingly little research that has looked at it within the UK. In 2009 Parentline Plus reported that they received an average of 95 calls to the helpline every month from parents concerned about their child’s verbal and/or physical aggression towards them: 91 per cent of the callers were female, with the majority of children aged between 13 and 15 years. More directly, research predominantly from the US, Canada and Oceania has explored parent abuse, and a number of consistent findings have come up. In particular, Kennair and Mellor (2007) review the literature to suggest that it is predominantly mothers, lone parents and those parents facing significant social and family stressors who are most likely to experience physical, psychological and financial abuse from their children. The children are more likely to be teenage (or the behaviour is more likely to be identified as ‘abusive’ at that point) and are more likely to have previously witnessed or experienced abuse or violence within the family home. They are also more likely to display significantly higher levels of ‘oppositional’ or aggressive behaviour than their peers, with a lack of engagement in school a further correlative factor. However, it appears that social class, ethnicity and the gender of the child is not significant, although Kennair and Mellor (2007) report some evidence that physical abuse is more prevalent in boys. As mentioned, the effects of experiencing abuse from one’s child can be profound. In the short term, ongoing parent abuse has been found to impact on a parent’s and other family members’ physical and psychological health, with specific negative emotions such as fear, shame, guilt and despair commonly reported (Cottrell & Monk, 2004). These effects extend to the child in question, who may experience helplessness and isolation, and in the longer term, there are concerns over the ways in which this form of abuse may transfer to other targets or be reproduced by other family members who witness it. A factor that perhaps is unique to this kind of abuse is the ‘culture of blame’, which has intensified over the past decade in relation to parenting. There is much evidence that this cultural climate has shaped both parental and societal responses to the problematic behaviour of children and young people. Furthermore, the introduction of Parenting Orders in 1998 has formalised this culture of blame by making parents ‘take responsibility’ for their children’s troublesome behaviour by issuing them with a court order, breaches of which can result in a summary conviction. This wider cultural and policy context may well have contributed to the sense that parents are in some way ‘deserving victims’ and who therefore attract less sympathy and support in comparison to others (e.g. children or elders) who experience family abuse. One of the key features of parent abuse is the way in which the experience is silenced. In writing about parent abuse while in the process of researching other aspects of parenting, both Hunter et al. (2010) and I myself (Holt, 2009) found parental experiences of stress and isolation, and that it was difficult for parents to articulate and ‘name’ the experience (which in itself is likely to contribute to experiences of stress and isolation). Furthermore, families and communities have been found to be unsupportive and in some cases may actively devalue parents’ painful experiences of parent abuse (Edenborough et al., 2008). There is currently a lack of acknowledgement of parent abuse within social and public policy, meaning that parent abuse tends to be framed within already existing policy discourses that are ill-fitting for the problem in hand. A ‘criminal justice response’ to parent abuse seems to be dominant in the UK, but the prospect of telephoning the police and pressing charges against their child is an option many parents will resist – not least because the outcome may be their own criminalisation in the form of a Parenting Order. Furthermore, any support that is offered alongside the criminalisation of child or parent is unlikely to be sufficient to adequately deal with the complexities of parent abuse. This is particularly so since youth justice support programmes tend to be offered to parents and children/young people separately, with little interaction between the two (Youth Justice Board, 2010). Other agencies, such as domestic violence agencies or child protection departments within social services, may be sources of support, but again there are likely to be complexities when dealing with children (and adults) who may be seen as both ‘victims’ and ‘victimisers’, making both options problematic (particularly as the agencies are likely to be already overwhelmed in responding to their own particular form of family abuse). Perhaps the most fruitful area for intervention work then is at the local level, where a number of different support agencies can focus specifically on ‘parent abuse’ within its own community and structural context. One recent positive example is Brighton and Hove’s Break4Change programme, which combined the efforts of the local Youth Offending Team, the Targeted Youth Support Service, Rise (a local domestic violence support service), the Family Intervention Project and support from Brighton Community CAMHS. The pilot support programme involved two parallel weekly sessions running for eight weeks – one for parents and one for young people aged 11–16 years. The programme was underpinned by a brief solution-focused therapeutic approach, and participants explored feelings of anger, blame and isolation, as well as strategies for change, including assertiveness, boundary-making, beliefs and self-care. Evaluation of the pilot programme found that it was successful in initiating change, with parents reporting a reduction in violence and isolation, and young people reporting increased empathy, reduced violence and increased satisfaction at home (Munday, 2009). Although it is yet unclear whether such changes can be maintained over the longer term, Break4Change is an inspiring case study which suggests that a non-punitive, multi-agency, whole-family approach is where thinking and practice should be heading. Clearly, new perspectives are required to help us to understand this troubling social problem. After all, if academics struggle to articulate and respond to the phenomenon, then one wonders how parents are able to do so – particularly those parents who are already facing multiple disadvantages and stressors. So, how might psychology help? Three specific suggestions come to mind. Firstly, there is a need for new theoretical frameworks to enable us to conceptualise and understand ‘parent abuse’ adequately – something that is yet to be achieved. This will require further research to highlight the intricacies of what is at play at an individual level, at a familial level and at a structural level, and a transdisciplinary approach may be the best way of teasing out how these levels intertwine. Such an approach is currently lacking: as in practice responses to parent abuse, there appears to be an over-preponderance of research and theoretical thinking at the criminological level. While useful, this risks inevitably constraining theoretical frameworks. I would argue that psychology, as a discipline that does not take a ‘topic’ as its focus (as criminology, social work and youth studies arguably do), is better placed to examine such complexities. However, this is going to be difficult for researchers in the current economic climate – and more so given that there are no robust data about the prevalence of the problem to draw on when making funding bids. Nevertheless, academics and practitioners from a range of subject disciplines have recently come together to create a UK research network (see ‘resources’) to enable discussion and to think about developing research and practice agendas, and I would encourage more psychologists to participate. Secondly, as the case study of Break4Change illustrates, there is also a role for psychology at a practice level in terms of supporting individuals, families and communities. Something as complex as parent abuse constitutes a key social problem where psychologists can draw on their specialist knowledge and skills across a number of specialisms (including educational, health, clinical, occupational and counselling psychology) and work together. Indeed, the programme that underpins Break4Change was developed by Eddie Gallagher, an Australian psychologist who has worked in family therapy and social work and has drawn on his work experience and psychological knowledge to develop specific resources for working with families characterised by parent abuse (see ‘resources’). Finally, in the interests of balance, perhaps one response from which psychology might refrain is the current and seemingly knee-jerk reaction of attempting to isolate and identify ‘risk factors’ in relation to parent abuse, whether of likely ‘perpetrators’ or ‘victims’. Psychology has a rich history of responding positively to concerns about child and adolescent behaviour (as well as parental behaviour) using contextualising theoretical frameworks, dating back from Erikson’s work and the notion of ‘identity crisis’ in adolescence. However, ‘risk factors’ do not tell us anything about causation (although they are often misunderstood as such) and serve to decontextualise what is clearly a complex phenomenon upon which issues of power and violence, gender and masculinities, rights and responsibilities and structure and agency all rise and collapse into each other. Risk factors also work as a tool for blaming individuals, particularly by governments who have been known to cite particular marginalised groups (e.g. ‘lone parents’) or behaviours (e.g. ‘poor parenting’) as a ‘risk factor’ to justify particularly pernicious policies (as in the case of Parenting Orders in 1998 – see Holt, 2008). This perhaps presents psychologists with a more critical role to play in informing policy makers about the ways in which government rhetoric can work to stigmatise families and individualise problems that are much more structurally complex, and can ultimately serve to exacerbate such problems. Clearly there is further debate to be had, and this article has only touched on some of the many complicated issues raised when conceptualising, researching and working with parent abuse. Nevertheless, from the little we do know, it would appear that psychology is very well placed to contribute a huge amount to help parents, families and communities to overcome the immediate and long-term effects of a problem that has been hidden for too long. Cottrell, B. (2001). Parent abuse: The abuse of parents by their teenage children. Ottawa: Family Violence Prevention Unit, Health Canada.Cottrell, B. & Monk, P. (2004). Adolescent to parent abuse. Journal of Family Issues, 25, 1072–1095. Daly, M. & Nancarrow, H. (2009). Restorative justice and youth violence towards parents. In J. Ptacek (Ed.) 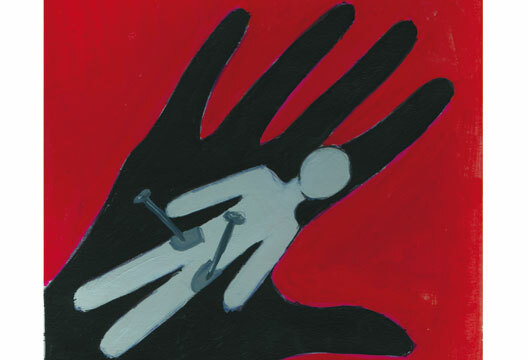 Restorative justice and violence against women (pp.150–176). Oxford: Oxford University Press. Edenborough, M., Jackson, D., Mannix, J. & Wilkes, L.M. (2008). Living in the red zone: The experience of child-to-mother violence. Child and Family Social Work, 13(4), 464–473. Holt, A. (2008). Room for resistance? Parenting Orders, disciplinary power and the construction of the ‘bad parent’. In P. Squires (Ed.) ASBO nation: The criminalisation of nuisance (pp.203–221). Bristol: Policy Press. Holt, A. (2011). From troublesome to criminal: School exclusion as the ‘tipping point’ in parents’ narratives of crime. In C. Hayden & D. Martin (Eds.) Crime, anti-social behaviour and schools. Basingstoke: Palgrave Macmillan. Hunter, C., Nixon, J. & Parr, S. (2010). Mother abuse: A matter of youth justice, child welfare or domestic violence? Journal of Law and Society, 37(2), 264–284. Kennair, N. & Mellor, D. (2007). Parent abuse: A review. Child Psychiatry and Human Development, 38, 203–219. Munday, A. (2009). Break4Change: Does a holistic intervention effect change in the level of abuse perpetrated by young people towards their parents/carers? Unpublished BA (Hons) Professional Studies in Learning and Development dissertation. Reece, H. (2009) The degradation of parental responsibility. In S. Gilmore, J. Herring & R. Probert (Eds.) Responsible parents and parental responsibility (pp.85–102). Oxford: Hart. I am currently supporting family members experiencing increasingly aggressive behaviour from an 11 year old male, possibly with high functioning ASD. I am starting to frame this behaviour in the context of attachment anxiety , with the outbursts of anger expressing uncontrollable impulses, as in Tourette's syndrome. I would be interested in professional discussion of this potential framework for understanding the drivers for parent abuse.